Dr. Howard Grant, CEO of Lahey Health (left) and Dr. Kevin Tabb, CEO of Beth Israel Deaconess Medical Center, addressed a meeting of the state’s Public Health Council in April. 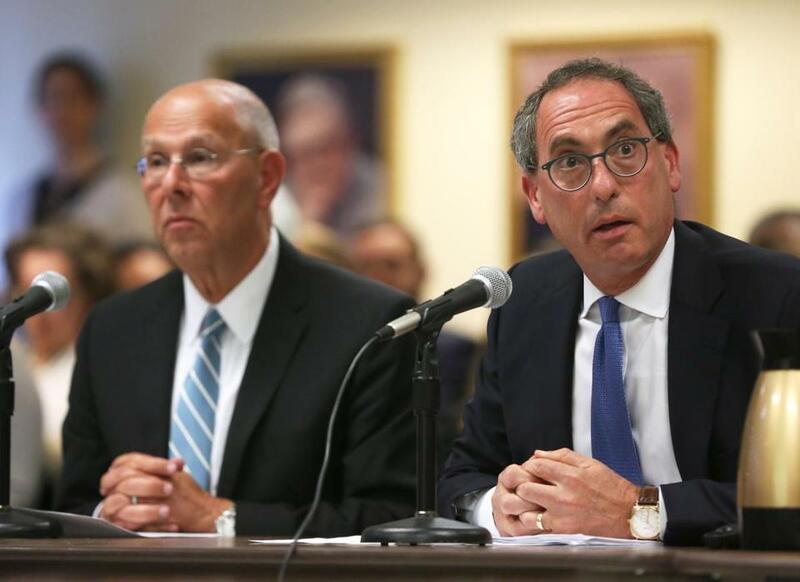 State public health officials Wednesday imposed new conditions on the planned merger of Beth Israel Deaconess Medical Center and Lahey Health aimed at requiring the hospitals to contain costs and maintain access to low-income patients. Officials said the conditions were necessary after the state Health Policy Commission reported in September that the transaction could raise spending significantly — at least $128.4 million to $170.8 million per year — by allowing the merging hospitals to charge more for their services. The state Public Health Council, a regulatory body chaired by the commissioner of public health, signed off on the merger in April but left open the possibility of amending that approval. The new conditions the council announced at a meeting Wednesday include: The hospitals must maintain services for low-income patients on Medicaid, and within six months, they must provide a plan for addressing the low percentage of Medicaid patients they serve. Within two years, the Beth Israel-Lahey system also must certify that all of its employed physicians participate in the state Medicaid program. The hospital system must report annually on how savings from their merger will be used to improve the quality of care and access to services. If the system exceeds the state benchmark for containing the growth in health costs, which is set at 3.1 percent a year, the system will be required to invest more in services at community hospitals and health centers. And, after five years, public health officials will ask the Health Policy Commission to conduct another detailed report on how the merger is affecting health costs and the market for health care services. “The Department is concerned that health care disparities might be exacerbated, and that, more generally, this increased bargaining power might have a negative impact on the [hospital system’s] patient panel’s access to care,” public health officials said in merger approval documents. The hospitals must comply with the new conditions in order to complete their merger. If they don’t meet certain conditions, they could face penalties of up to $250 million. The 13-hospital merger includes all of the Beth Israel Deaconess hospitals, all of the Lahey hospitals, as well as Mount Auburn, New England Baptist, and Anna Jaques hospitals. The deal still needs clearance from Attorney General Maura Healey, who is also weighing conditions to address concerns about the deal’s effect on costs and access to medical services. Seeking to offer some reassurance to skeptics of the merger, Dr. Kevin Tabb, chief executive of Beth Israel Deaconess, said the deal is being heavily scrutinized and regulated. “The conditions being imposed are unprecedented in nature — in this state and, in my mind, if we look around the country,” he told public health officials Wednesday. Tabb added that the hospitals are talking to Healey’s office about making “significant long-term investments” in community health care providers. Tabb and other executives of Beth Israel Deaconess and Lahey have argued that their large new hospital system will be an appealing alternative to the state’s dominant health care provider, Partners HealthCare. But some critics of the merger, who say the deal will raise costs and increase disparities in the health care market, remained unsatisfied by the new restrictions on the deal. “There is nothing here to protect us from higher prices,” she said.